While you've got your dictionary out, what's the difference between botany and horticulture? Excellent question! The official answer in the dictionary is that botany is “the science of plants” and horticulture is “the science and art of cultivating plants". In other words, a botanist might be interesting in spending hours and hours in a herbarium looking at dried specimens of plants, studying their characteristics and what makes them unique. A horticulturalist, on the other hand, would enjoy hours and hours out in a garden planting and pruning and tending to the plants. Botanists might like to do that, too, but might also stop on occasion to figure out the name of a plant by looking at the flower parts to see if they can figure out what plant family it belongs to, and then from there take it down to a genus and then a species using a taxonomic key. A horticulturist might like to do that, too, or they could just look at the plant tag. I hope this helps to understand the differences between these two fields of study. Or should that be gardens of study? 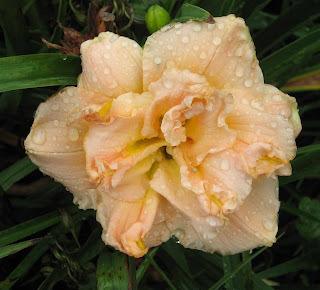 Botanists study the daylily as a flower. Horticulturists grow it as a plant. I’ve noticed that Carol has been eating a lot of cantaloupe from her garden and letting people know about it via Twitter and Facebook. Enough of that already! Cantaloupe is my favorite but I’m surrounded by daylilies, which you can also eat. I even have a book of recipes that use daylilies! I would be willing to swap plants for knowledge on how to do a veggie and melon garden next summer. How do I get started??? While your offer is generous to trade plants for knowledge, I believe that every gardener has the obligation to share their gardening knowledge for free to other gardeners! Your question is very well timed, though, because fall is an excellent time to work the soil and prepare it for next year’s garden. I recommend that new veggie gardeners start out with a small plot and once they taste the success they’ll have with vegetables, they can expand the garden each fall for the next year. 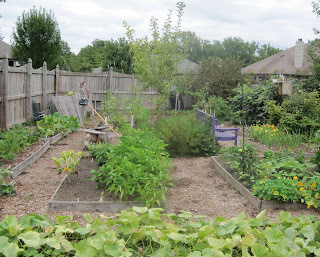 You can begin with a 4’ x 8’ raised bed located in a sunny area, as sunny as you’ve got, and as close to your back door as you can get it, so it will be easy to get to when you are cooking and think, “gosh I could use a green pepper”. Then because the garden is close to the back door, you can just walk out to your garden and pick the pepper, if you have peppers growing in your garden. Anyway, once you’ve figured out where you want your first raised bed to be, frame it with 1’ x 6’ cedar boards or any other untreated lumber Then remove the sod or put down a layer of newspaper that is seven or eight pages thick to smother it. Next pile the new raised bed up high with compost, good top soil, leaves, etc. in alternating layers and leave it until spring. 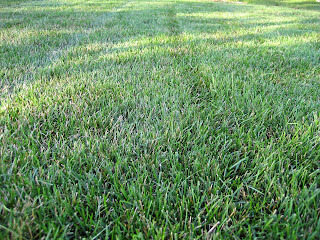 By spring, after all the freezing and thawing of winter, you should end up with good, rich dirt to plant it. Since you also want to grow cantaloupe, I recommend you start with two 4’ x 8’ raised beds, or one 4’ x 16’ raised bed. Short of getting out a handgun, do you have any recommendations for getting rid of big, ugly grasshoppers? I dusted the place with diatomaceous earth so that my front porch looks like I sprinkled it with powdered sugar. “Big, ugly”? Hand guns? Oh my! Did you know that grasshoppers are edible? I’ve never personally eaten any as we don’t have that many around here and I’ve never been that hungry. Crunch. I do think it is wise to not resort to a hand gun as that is likely to make a big, ugly mess. I think you are on the right track with the dichotomous diatomaceous earth. As for the mess of it, think of it this way, if you leave all that dichotomous diatomaceous earth on your porch after the grasshoppers are gone, it will be a good foundation for holiday decorations. Was that helpful? If you have a question for Hortense Hoelove, please leave it in the comments. It might be featured next week in the next edition of "Dear Hortense"! Oh I do love you Hortense! I have you in my reader and always look forward to your posts. But I draw the line at eating grasshoppers! Thanks for detailed explanation of hort. vs bot. Thanks Hortense...I wonder if the large ugly grasshoppers aren't locusts? I know we miss ID them around here for a while. Note to Carol: Received my Cobrahead yesterday and squealed like the girl I am!! Will post it later today..Thanks again.. I linked to you today, please come by and see. Good advice re: handgun. Most grasshoppers are too small to hit with bullets. But I must quibble with you Hortense, over that comment "Veggies Make A Garden Real." So what are shade gardens? Figments of the imagination? Illusory gardens? Am I imagining the plants grouped together, growing and blooming, provides scent, color & texture, shelter & food for critters? I hope you address this issue in your next post. Once again you have educated all of us, Ms. Hoelove. However, I'm still a little confused--I look at tags rather than worry about taxonomy, so I guess that makes me a horticulturist. On the other hand, I grow daylilies because they're flowers, so does that make me a horticultural botanist? Or a multi-cultural gardener? Or a...never mind. In the spring, we have these small grasshoppers that are black with red stripes. Their scientific name is Romalea microptera. When I first start seeing them, they will be in a group. In this early stage, I will sprinkle Sevin Dust on them. As they grow bigger, I will put on a pair of gloves, then pace the yard with a bucket of soapy water, picking up any that I see and place them in the soapy water. When they are full grown, our pit bull then does the dirty work. It is a constant battle, but if let unchecked, they will wipe out everything in the yard.